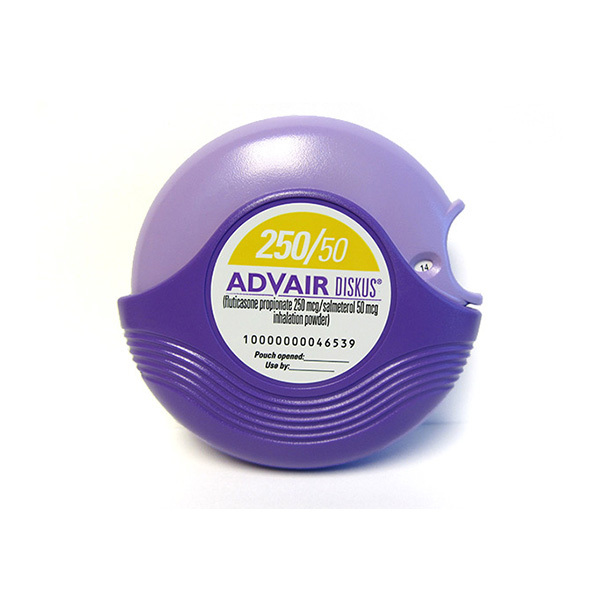 Advair Diskus is a combination of two different chemicals in an inhaler that is used for preventing an asthma attack. It is also used to prevent flareups of chronic obstructive pulmonary disease (COPD) . Advair Diskus works by relaxing the muscles in the airways. Follow the dosage instructions provided by your doctor or as mentioned in the instruction booklet/product label. Always use only as prescribed. Never exceed the dosage. .
Read the instructions carefully if it is the first time you are using Advair Diskus. Sit on a flat and level place to use this medication. Now hold it in one hand and with the thumb of the other hand push away on the thumb grip until you hear a click sound and the mouthpiece clicks into position. Moving the lever multiple times or fiddling with the lever may cause an unwanted wastage of the medication. Now hold it away from your mouth and breathe out completely but not into the inhaler. Now keep the inhaler mouthpiece to your lips and breathe in deeply. Remove it and try and hold your breath for as long as you can do it comfortably. Now close the device the same way that you opened it by pushing against the thumb grip. Advair Diskus is a very fine powder that has no or very little taste. Most people get a feeling that Advair Diskus was not administered at all which leads them to using multiple doses. Do not use it multiple times even if you do not get a taste of the medicine. If you think that Advair Diskus is not being administered, then speak to your doctor. It is important to rinse your mouth with water after using Advair Diskus. You must never swallow the rinse solution. If you have been prescribed other similar medications, then please wait for some time between the two. Your doses of Advair Diskus must be taken at least 12 hours apart from each other. Throw Advair Diskus away exactly 1 month after you remove it from the foil pouch, or if you exhaust the dose and the dose indicator reads ‘0’. Discuss your medical history with your healthcare provider before you start using any new medication..
•	If you have had a recent vaccination, if you have weak bones (osteoporosis) or have risk factors for osteoporosis (eg, a family history of osteoporosis, tobacco use, long-term use of corticosteroids or certain seizure medicines, limited physical exercise, poor nutrition). •	Or if you are having an asthma attack (eg, sudden, severe onset or worsening of asthma symptoms such as chest tightness, cough, shortness of breath, wheezing), you are using another type of long-acting inhaled bronchodilator (eg, formoterol inhalation powder, salmeterol inhalation powder), you are taking an azole antifungal (eg, ketoconazole), certain HIV protease inhibitors (eg, ritonavir), a macrolide antibiotic (eg, clarithromycin), nefazodone, or telithromycin. Advair Diskus is known to cause drowsiness or dizziness. Your vision may be blurred and your judgement affected if you consume alcohol with this medication. So, avoid using alcohol while using Advair Diskus. Advair Diskus is known to react with medications like Diuretics (eg, hydrochlorothiazide, furosemide) or long-acting inhaled bronchodilators (eg, salmeterol inhalation powder, formoterol inhalation powder), Beta-blockers (eg, propranolol), Azole antifungals (eg, ketoconazole), catechol-O-methyltransferase (COMT) inhibitors (eg, entacapone), delavirdine, HIV protease inhibitors (eg, ritonavir), macrolide antibiotics (eg, clarithromycin), MAOIs (eg, phenelzine), nefazodone, short-acting beta-agonist bronchodilators (eg, albuterol), telithromycin, or tricyclic antidepressants (eg, amitriptyline). Copyright 2014. my-canada-store.com All Rights Reserved.